Fuel up with the most extensive nutrition selection in Austin. Coming soon - the Cervelo P5! Simply Faster! Stop by ATC and check out our vast nutrition selection, featuring Hammer, Gu, Clif Bar & Co., Powerbar, PureSport, and more. Clif Shots will be on sale for $1.00 each. These are 90% organic, offer multiple caffeine options (including caffeine free), contain electrolytes, and provide a quick source of energy. ATC has a full selection of SPIbelt products, an Austin original! We just received the latest and greatest from 2xU Compression. We have the full line of Active and Recovery Compression tights, socks, sleeves, and more. Plus, we still have Zoot shoe closeouts! 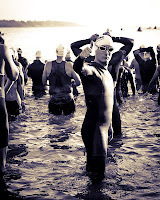 Great for the upcoming Tri Season. Check out the latest closeouts from Cervelo - Cannondale - Kestrel - Litespeed. Every workplace has its hazards. Still, there are some challenges a multisport photographer faces that go above and beyond the typical call of duty. Finish line shots of overextended runners giving their all, including the contents of their stomach, are common enough that photographer Andrew Wolfe has had a number of close calls. If you don't want to sport a hazmat suit, fitness and quick reaction times are just a part of the job description. Andrew, owner of PhotoWolfe.com, is a frequent contributing photographer to the ATC blog, covering everything from 5ks and half marathons to cycling events and triathlons. His wife, Megan Wolfe (Megan Blood before their marriage last October; and yes, Andrew says, her name could have been "Blood- Wolfe"), often picks up a camera to help out when she's finished competing in events. An avid runner and triathlete since 2009, she was Andrew's inspiration to start his own photography business. "At my wife's fist tri, I brought out a camera, a Canon Rebel XT with a kit lens that we had sitting around the apartment," he says. 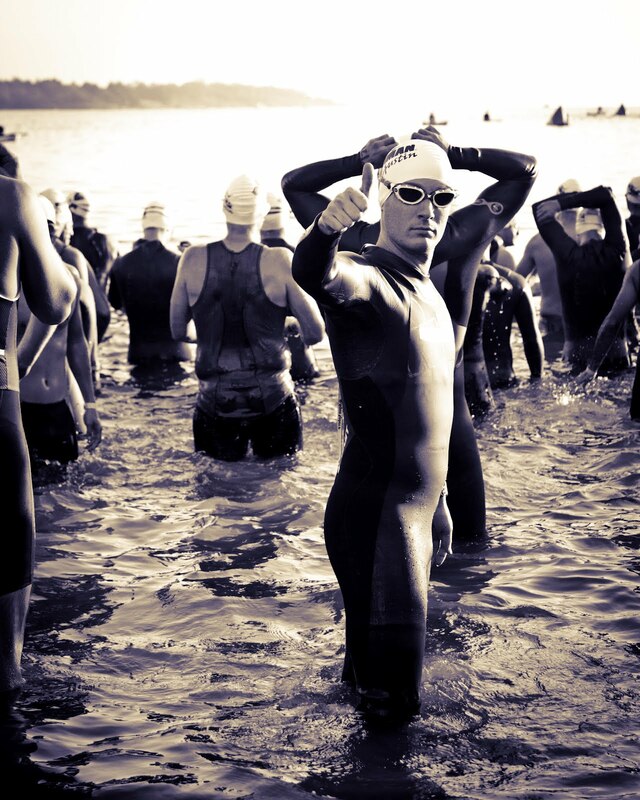 "After her first triathlon, I knew we had both found a new passion. Before her second triathlon, I upgraded to my first pro lens, which I bought off Craigslist. At the second race I met a great photographer, Jake North, who took a look at my shots and gave me a few recommendations and pointed me to some resources online." 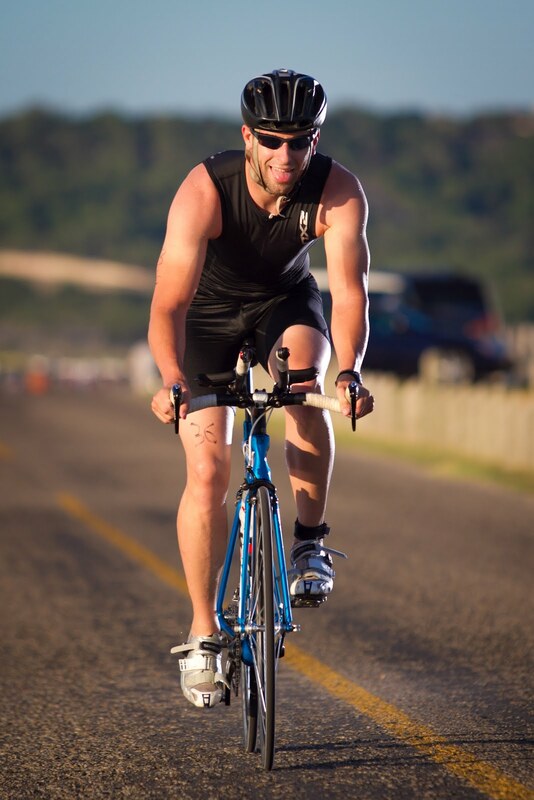 Andrew signed up for his first triathlon, the Fort Hood Triathlon, in September 2011. 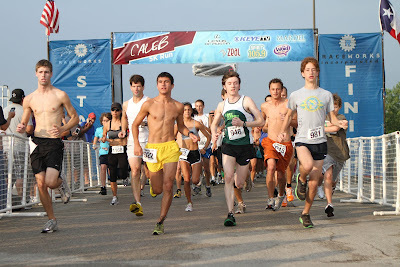 Due to the lack of rain, however, the race became a duathlon. 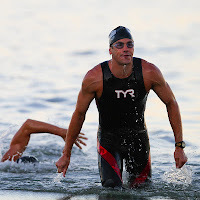 He admits it was a disappointment, since the swim would have been his strongest leg, but he still had a great time racing. A month later, he ran his second-ever 5k on the morning of his wedding. Andrew says he'll probably race this season, but he's also fond of his place behind the camera. After two years of out-on-the-course experience, he's happy to help others with advice on site or by email. He recommends a DSLR to shoot any sporting event. "Be sure to keep the shutter speed at or above 1/500 and the aperture at the lowest possible setting," he says. "Most of the time, I shoot with the camera in portrait orientation in order to put as much of the runner in the frame as possible. Also be sure to center the runner in the frame." Repetition is key, he says. "Shooting races is all about finding a good shot you can repeat for every person. From the camera bodies to lens I use, they are all built for speed and accuracy. It can get hard preparing shots that are far enough from the start line so runners are spaced out enough but close enough to the finish line to make it back for the first finisher." What's Andrew's favorite type of event to photograph? He says that question is easy. 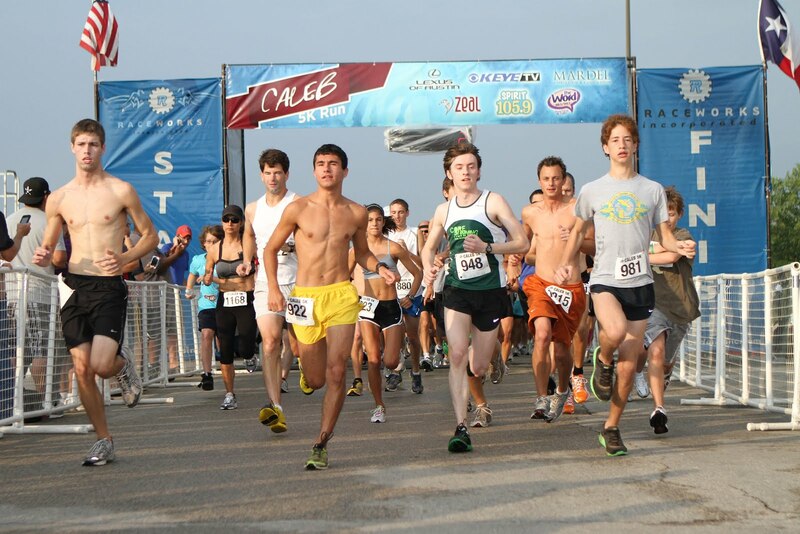 "I like capturing a runner's first race or PR. The satisfaction and accomplishment on their face when they cross the line is awesome." All photos are by PhotoWolfe. Visit PhotoWolfe.com for contact info and more shots. Bike racing – sleeves, socks, careful color coordination, calculated backstabbing, shaved legs regardless of gender. On a good day, you might feel great and be in the right place at the right time. On a bad day, you might miss a break that sticks, get caught up in a crash, have a flat, or find yourself in the back of the pack before the final sprint with nowhere to go. There are no "finisher's" medals, and for placing near the top you're more likely to go home with a check or an envelope full of cash than a shiny plastic trophy. It's a no-frills culture that contradicts itself, at times, with its rigorous fashion rubric and petty intrigues. In essence, if you're up for a challenge and a gamble with Lady Luck, a weekend of bike racing is about as entertaining as it gets. Holland Racing has a reputation for putting on well-organized races at exciting venues, and true to form, the Alsation Country Omnium was run with business-like efficiency and panache. Held in Castroville, a small town about 30 minutes west of San Antonio, the two-day event included a circuit race, time trial, and road race, with a total purse of $10,000 and fun, drinkable primes like cases of Honey Milk and bottles of locally made Deep Eddy Vodka. The circuit-race course, closed to traffic, was a 2.5-mile loop on a wide, smooth road in an area dedicated mostly to medical research facilities. For the women, the race was 40 minutes. Although we were originally scheduled to start with the 50+ Men's race, a last-minute verdict allowed our 16-person field to start separately. The main player for the women's race was, without a doubt, Bicycles Outback. With six riders in the mix, they set the pace – and a fast one, at that. They launched attack after attack, with the rest of the field scrambling to chase them down. With three riders, Team Brain and Spine also had the strength of numbers. That left seven of us to our own individual devices, including Tracie Akerheim of Think Finance, Shannon Gaffney of Bicycle Heaven, Morgan Patton of Team Type 1, junior rider Amber Vredenburg of T3Multisports, Annalisa Fish of Austin Flyers, Suzy Snell of Colavita, and myself for Snapple-ATC Racing. It was an interesting race – something was always happening. With the coordinated attacks from Bicycle Outback, the pace rarely slowed, and the turns were sharp enough to keep it exciting. Just after the officials announced a prime lap, Annalisa and I broke away. We held off the rest of the field to get the two-deep prime, but the pack was working hard to catch us. We were taken back into the fold after another half-lap, still with two or three laps to go. The last hill into the finish was a slight incline, not steep enough to eliminate the advantage of being in the draft, but enough to increase the difficulty of the final sprint. We were all crammed in tightly together when someone started to sprint around 400 or 500 meters. Stuck near the middle of the pack, I realized I wasn't where I needed to be. A crash had happened around this point in the race for the Cat 4 Men, but I reminded myself that I was not a Cat 4 man and neither were my fellow riders – we could get through this without bloodshed. I had to ease up to go around the rider to my left, but then I had a clear path to the finish. I crossed the line just ahead of Tracie Akerhielm, who took second. All categories completed the same 4.8-mile, out-and-back time trial, which was gently rolling except for a final rise into the finish. We were well prepared for it, since it included a large part of the circuit race course. Now we would be using both sides of the road, no longer completely closed to traffic, but the pavement was wide and the few cars driving through seemed to mostly be race spectators or participants. The top Pro 1/2 men, coming in at an average of 31mph or higher, were probably cruising close to the posted speed limit. Because of my mechanically minded husband, Jack Mott, I have every aero gimmick that's fairly important and within reason – a Cervelo P2, an aero helmet, a deep front wheel, a disc cover for the back wheel. 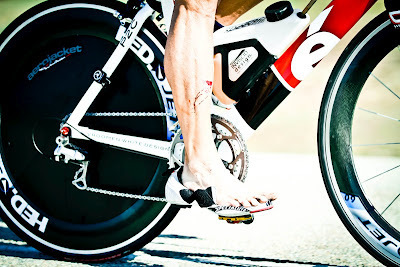 When I started riding my first tri bike – again, a gift master-minded by Jack – I got a fairly aggressive fit from Austin Tri-Cyclist, so I didn't know enough to request a more comfortable, slower position before I was used to the "right" one. TTs and duathlons were my first introduction to the world of cycling. Many women roadies don't do multisport events or TTs outside of omniums and stage races, so they often complete the TT portion on road bikes. That puts them at a heavy disadvantage, as much as three or four seconds per kilometer. Still, many would argue that it's not enough of a disadvantage to invest in the equipment or go to the trouble of bringing two bikes to an event. In an omnium, you don't get as many points or as much prize money for a TT as for a crit or road race. All the Bicycles Outback riders were on their new custom Calfee frames with Ultegra Electronic Di2 gruppo. (Now those are beautiful bikes.) But I knew Nadia Barrera of Team Brain and Spine was a strong time trialist and had the gear, and I saw a few other aero helmets and TT bikes. I knew I was going to have to work hard for it. Plus Jack and I had a bet going for who could post the fastest time – he'd placed 8th in Cat 4 at 10 minutes and 30 seconds. I didn't have a watch, but I figured if I gave it everything I could come close. I used to look forward to time trials. Now that I've come to know them better, however, I've lost all my affection for them. A time trial is just a pure test of pain, a question of how bad you're willing to hurt and for how long. A terrible opportunity, too, to get to know your inner self a little too well, all those voices in your head lining up to tell you why you should or shouldn't slow down. But as much as I dread the experience, I love the spoils. When I found Jack after the finish he just held up his watch and grinned – 10 minutes, 30 seconds, and some change. We had to wait for the official results to be posted to decide the victor. Fortunately, with Holland Racing that doesn't take long. I had placed first among the women. Annalisa Fish had a surprisingly fast time, taking second on a road bike with clip-on aero bars. But was my brutal, eye-bulging push to the line worth it for those last few milliseconds? I'd say so: Jack: 27.42mph, Kat: 27.43. Aww yeah. It was a gray day. The sort of grayness that should be spelled the British way – a watery, weak, cold, completely drained-of-color grey morning. Rain was forecasted for the afternoon, and we had 47 miles ahead of us. We'd been warned that the course would be narrow and rough in spots, with cattle guards and less- than-perfect road surfaces. Starting from the Hotel Alsace, it was a lollipop – 14 miles out to a 19-mile loop, and then back again. The warning was no exaggeration. Wad up a piece of paper into a tight ball, lay it out flat again, poke about two hundred holes in it, and then turn it into asphalt, and you've got something like the Gilliam Switch Road loop. Bicycles Outback ruled the day again, sending attack after attack up the road. Sheri Rothe, along with Shannon Gaffney of Bicycle Heaven, was in one lasting break, and Kathleen Hattaway soloed away for another. The rest of the pack wasn't pulling together well for the chase, but after a while someone would get the job done, and then the cycle would start again. Like the circuit race, the road race was interesting because something was always happening or about to happen. Since women's races often lack organized teams, not to mention male bravado, they can sometimes be quite slow, with no one willing to push the pace. Bicycles Outback was keeping us on our toes. Oddly enough, we got a brief sprinkling of rain on the loop and some of the roads were soaked, including the final stretch into the finish line, but we never hit the heavy downpours. And though it was cold, at around 45 degrees, it wasn't miserably so. I was definitely looking for the finish about 10 miles before we actually got there, but overall I was feeling good. So when I had an opportunity to work with Sheri Rothe in the last few miles in a two-woman break, I took it. We put our heads down and kept a high, steady pace until the end. The pack chased at first, then fell back enough that we knew we were safe. I think in my excitement I actually said, "We got this." I took first in the road race and in the overall omnium, certainly my best-ever weekend of racing. Sheri took second in the omnium, and Tracie Akerhielm came in third. To view the full results, click here. Many thanks to all the organizers, officials, sponsors, and others who made the weekend fun and safe!